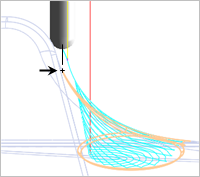 Blog / What is Surface Feature Machining? 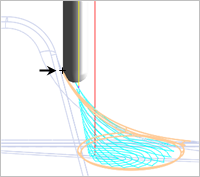 What is Surface Feature Machining? Surface Feature Machining is a new enhancement in our 2017 MILL modules that provides added control of the cutter’s position in relation to the boundaries of the selected surfaces. 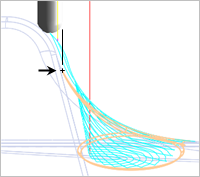 Cutter positioning is controlled while maintaining tangency with adjacent surfaces, assuring a gouge-free toolpath. 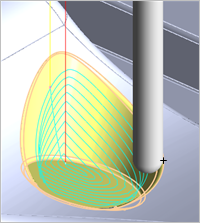 As you can see in the 3 Axis Radial toolpath shown in this example, the tool’s axial position is maintained ON the outer boundary of the selected surfaces. TO and PAST conditions are also supported as shown in the examples below. This feature comes in handy when you need to finish only one or more surfaces of your part without affecting the adjacent surfaces. Surface Feature Machining is an important new tool in our 2017 Mill modules. 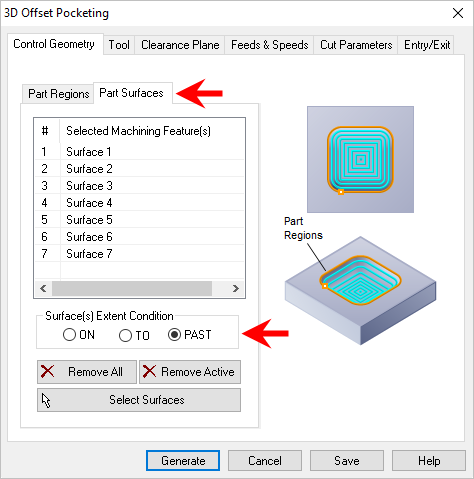 With this functionality, you can now very easily isolate one or more surface features for machining while at the same time controlling boundary conditions for the resulting toolpath. For example, a surface on your part may need additional finishing with a smaller tool or a finer step over. This new functionality allows you to do that very easily. Another application may be that you only want to machine a subset of surfaces while ignoring the rest. In the 3 Axis operation dialogs, there is now a new sub-tab on the Control Geometry tab named Part Surfaces. Selecting this will provide the Surface(s) Extend Condition options ON, TO and PAST. The tool axis will be constrained to remain ON, go up TO or extend PAST the outer perimeter boundary of the selected surfaces. 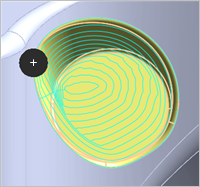 For the TO and PAST conditions the diameter of the tool in relation to the surface boundaries will constrain the extent of the toolpath. 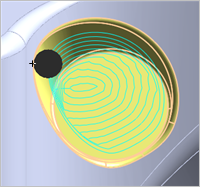 Each of these conditions will also maintain tangency of the tool when it makes contact with adjacent surfaces. 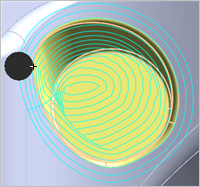 The 3 Axis 3D Offset Pocketing dialog shown below produced this toolpath example. 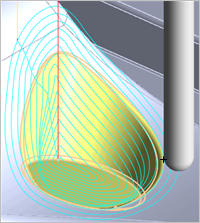 The images below illustrate how the center of the tool is constrained in relation to the outer boundary of the selected surfaces for each condition (ON, TO & PAST). Also, notice that in each condition, the tool always remains tangent to the surfaces adjacent to the selected surfaces. 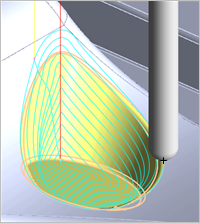 The center of the tool is ON the surface boundary. The diameter of the tool is up TO the surface boundary. The diameter of the tool is PAST the surface boundary.